Shantou, formerly romanized as Swatow and sometimes known as Santow from its local Teochew pronunciation, is a prefecture-level city on the eastern coast of Guangdong province, China, with a total population of 5,391,028 as of 2010 and an administrative area of 2,064 square kilometres (797 sq mi). Shantou has direct jurisdiction over six districts and one county, and the six urban districts of Shantou have a population of 5,330,764. With it and the surrounding cities of Jieyang and Chaozhou, the metropolitan region known as Chaoshan covers an area of 10,404 km2 (4,017 sq mi), and had a permanent population of 13,937,897 at the end of 2010. It’s built up area spread of 11 districts was home to 11,635,577 inhabitants at the 2010 census. Shantou, a city significant in 19th-century Chinese history as one of the treaty ports established for Western trade and contact, was one of the original Special Economic Zones of the People’s Republic of China established in the 1980s, but did not blossom in the manner that cities such as Shenzhen, Xiamen and Zhuhai did. However, it remains eastern Guangdong’s economic centre, and is home to Shantou University, a member of the Project 211 group. The Shantou dialect, formerly known as the Swatow dialect, is a dialect mostly spoken in Shantou in Guangdong, China. It is a sub-dialect of Min Nan Chinese, and sometimes a sub-dialect of Teochew Min. Yuan Renminbi (CNY). It is issued by the People’s Bank of China (PBOC, central bank). The official abbreviation is CNY, although also commonly abbreviated as “RMB“. Chinese paper money usually comes in 1 fen (rare), 2 fen (rare),5 fen (very rare), 1 jiao, 2 jiao, 5 jiao, 1 yuan, 2 yuan, 5 yuan,10 yuan, 20 yuan, 50 yuan and 100yuan. 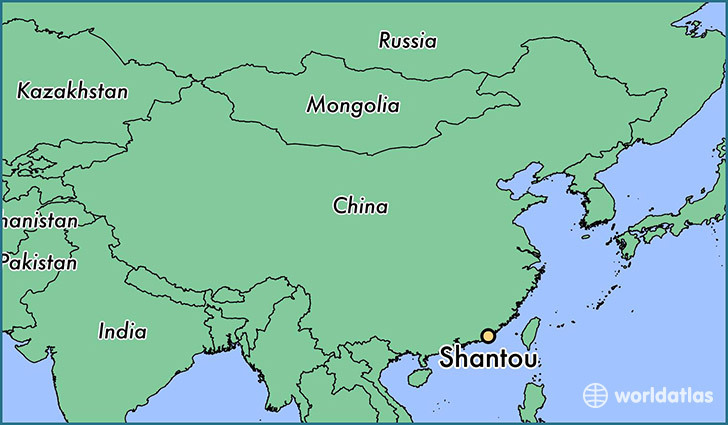 Shantou is located in eastern Guangdong with latitude spanning 23°02′33″ – 23°38′50″ N and longitude 116°14′40″ – 117°19′35″ E; the Tropic of Cancer passes through the northern part of the city, and along it there is a monument, in fact the easternmost in mainland China, at 23°26′33″N 116°35′20″E. The highest peak in the city’s administration is Mount Dajian (大尖山) on Nan’ao Island, at 587 m (1,926 ft); the highest peak on the geographic mainland is Mount Lianhua (莲花山), at 562 m (1,844 ft) in Chenghai District. The city is located at the mouths of the Han, Rong (榕江), and Lian Rivers. Shantou has a monsoon-influenced humid subtropical climate (Köppen Cfa), with short, mild to warm winters, and long, hot, humid summers. Winter begins sunny and dry but becomes progressively wetter and cloudier. Spring is generally overcast, while summer brings the heaviest rains of the year though is much sunnier; there are 8.2 days annually with 50 mm (1.97 in) of rainfall. Autumn is sunny and dry. The monthly 24-hour average temperature ranges from 13.8 °C (56.8 °F) in January to 28.3 °C (82.9 °F) in July, and the annual mean is 21.53 °C (70.8 °F). The annual rainfall is around 1,630 mm (64 in), about 60% of which occurs from May to August. With monthly percent possible sunshine ranging from 28% in March to 58% in July and October, the city receives 1,979. Shantou’s economy is medium by Guangdong standards. Manufacturing accounts for a large and increasing share of employment. Canning, garments, lithography, plastic, and toys are some of the principal products. Toy manufacturing is the city’s leading export industry, with 400 million U.S. dollars worth of exports each year. Guiyu, a populous town in Chaoyang District, is the biggest electronic waste site on earth. Health-environmental issues incurred have concerned international organisations such as Greenpeace. In 2000, the biggest tax fraud in the history of the People’s Republic of China was uncovered, estimated worthy of 32.3 billion yuan. Shantou people share the same culture with other Teochew. The tea-drinking tradition widely practised in town is a classic instance. According to China Daily, Shantou people “drink more tea than anyone else in China, in total 700 million yuan (US$87.5 million) each year”. Most of the population in Shantou is non religious or practices traditional folk religions, Buddhism, Taoist rites, or worship of gods and ancestors. About 2% of the population belongs to an organised religion, with 40,000 Protestants, 20,000 Catholics and 500 Muslims. St. Joseph’s Cathedral of Shantou is the cathedral of the Roman Catholic Diocese of Shantou. The private car has matured as a transport option for Shantou residents. However, more still travel by autobikes. Public transportation is provided by bus, ferry and taxi. Shantou previously had its own civil airport, Shantou Waisha Airport. It was formerly the main airport serving the Shantou until nearby Jieyang Chaoshan Airport was opened on 15 December 2011. Shantou Waisha Airport became a military airbase since then and all civilian flights were transferred to the newly built airport in Jieyang. Taxi is the usual way to travel between the airport and the city proper. The taxi fare is around 60 RMB. There are 3 railway stations which serve Shantou: Chaoshan Railway Station and Chaoyang Railway Station which lie on the Xiamen-Shenzhen Railway line, and Shantou Railway Station which lies on the Guangzhou–Meizhou–Shantou Railway.